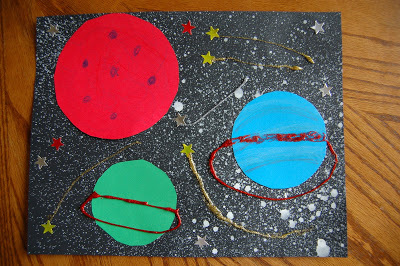 Since we learned some about the Moon this week, I thought it appropriate to learn about the Solar System and our Planets. 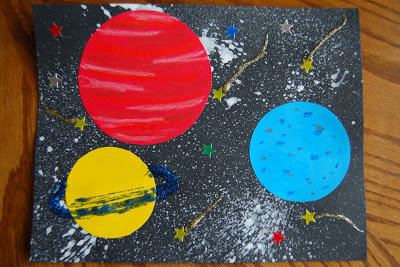 My boys love Space! 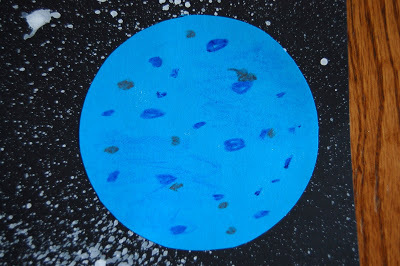 They love looking up at the stars at night, they love talking about how the Sun is lava hot, and they love to fight debate over which Planet is the coolest. Sometimes it’s difficult for me to find a craft that I know my 6 yr old and 4 yr old will both fall in love with but this week I found it! We created our very own Universe. I am a HUGE fan of art that has several different layers to it like this one. 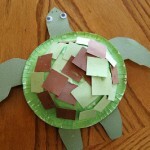 I think it really gives children a chance to be imaginative and create exactly what they want to. After we finished this project my 6 yr old said, “Can we make this again tomorrow?” That is how much they loved it! This is how we created this cool project. 1. 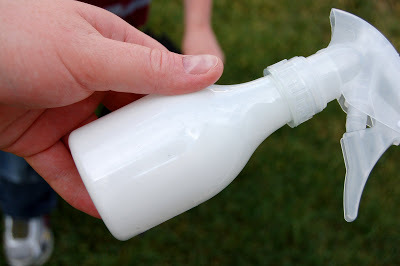 Put a small amount of white paint inside a spray bottle and dilute it down with water. 2. Spray a couple sprays onto your black sheet of paper. This creates that Galaxy look to your picture. Let the paint dry completely. It was sunny outside so it only took like 10 minutes to dry. It really only takes a couple light sprays. 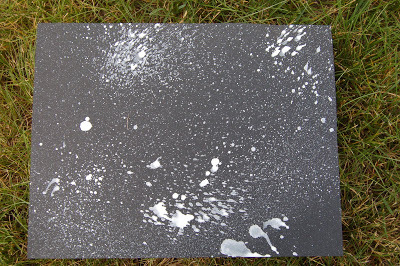 Ours looked liked this after spraying. 3. 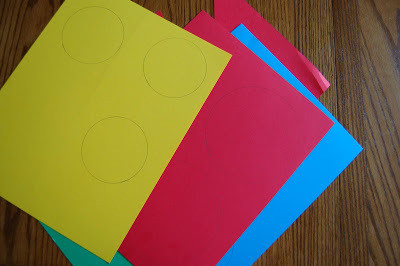 Draw different sized circles onto a variety of bright colored pieces of card stock. 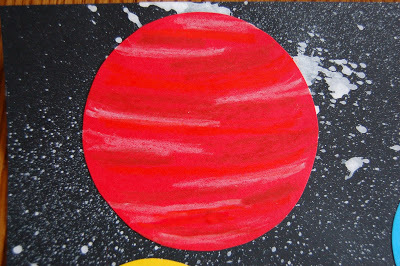 These are Planets so we didn’t want them all to be the same size. 4. 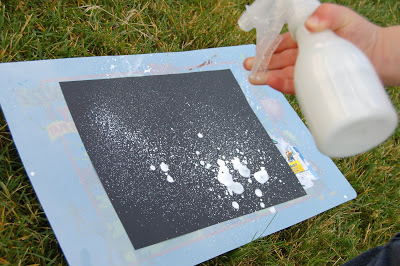 Cut out the circles and glue them onto your black paper. 5. 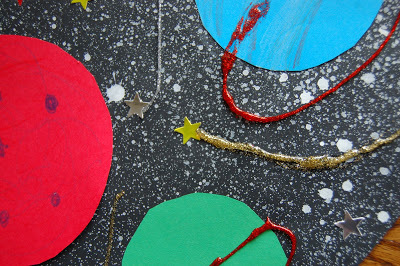 Add whatever details you’d like to your Planets with crayons and glitter glue. 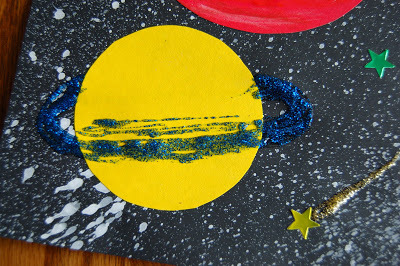 My boys loved using the glitter glue for a ring around a Planet. Andy suggested we make shooting stars. He even came up with the idea to add the gold star on the end of the tail. He is a Genius, I know! hahaha And I totally copied HIS idea on my own Universe, I’m such a copy-cat. LOL! 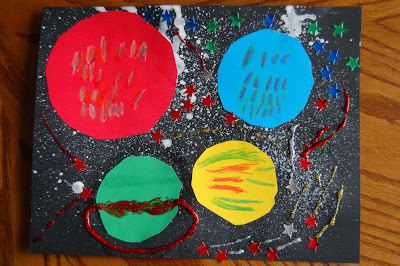 And there you have it….An “Out of This World” Craft. 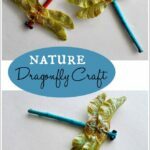 Oh, and here are a couple books you can use with this craft. 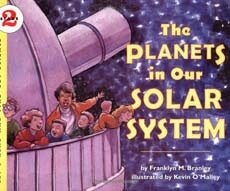 “The Planets in our Solar System” by Franklyn Branley. 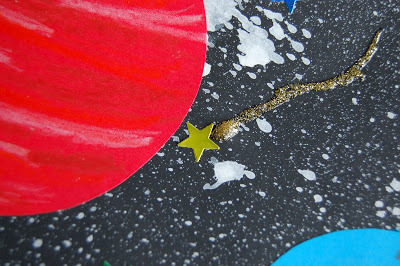 “There’s No Place Like Space” by Tish Rabe. 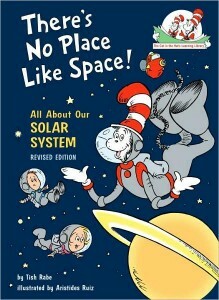 We love all the Dr. Suess Books at our house like this! Linking up to THESE fun parties. This looks amazing! I love the effective of the paint applied with a spray bottle. So cool! Thanks for sharing! This is so cool! In my school days, We used to do the spray effect using tooth brush. Love your blog! You have some really great ideas. 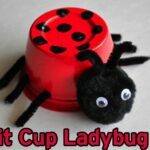 I grabbed your button, please return the favor if you like my blog. Thanks! So fun! At first I thought it was sandpaper.. I love the different textures! THanks so much for showing it off! Just featured this at Little Lucy Lu! As always … you ROCK, Rachel!!! how fun is this?! It turned out great and it's nice to use a few different techniques! I like how each turned out slightly different! I would love to invite you to link thsi up to the Sunday Showcase (anytime before the linky closes on Thursday) Hope you'll stop by for a visit – we'd love to have you link up. What a wonderful idea, I will be starting a space theme in the next couple months with my 6 kiddos and I will be adding this one into our plans! Thanks for sharing!! Fantastic! I love the layers. My little boy loves space right now. Thanks for the great idea!